As the parent of a preschooler, you likely have been searching the community for a preschool you can trust. You can end your search with 1, 2, 3 You ‘N Me Preschool. We are conveniently located in Peoria, which means we are close to your place of business and your home. We offer excellent programs to help develop your child’s education and prepare them for grade school. Rest assured, your child will be part of a safe and stimulating environment that promotes social skills and learning. At our core, we believe self-esteem is essential to learning, particularly to the development of those special intellectual qualities of originality and creativity. 1, 2, 3 You ‘N Me Preschool welcomes you to come see why we are the best preschool in Peoria IL. There are many things we offer that make us stand out from all the rest. From carefully selected teachers to hands-on sensory experiences, your children will be in good hands here. We understand preschool-aged children view the world as a place of wonder that they can see, hear, touch, taste and smell. As such, we give them plenty of hands-on learning opportunities their senses can experience with a preschool program designed to meet their growing educational and social needs. Throughout the day, they will spend quality time with friends and engage in age-appropriate activities. We strive to provide an ideal environment for your children, achieving those goals through both outdoor and indoor playing and learning areas. Ultimately, we want to foster a sense of independence in your children so they can take on challenges in the real world. 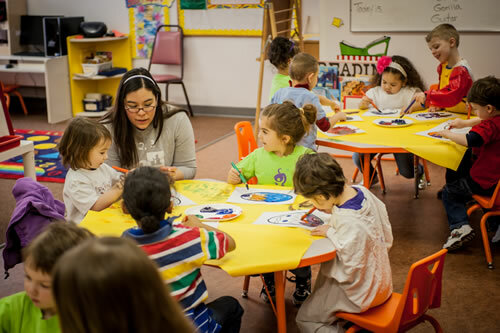 Our full-day preschool runs from 8:30 a.m. to 3:30 p.m., with Morning Care and After-Care available if needed. It’s time you found out why we are the best preschool in Peoria IL. Book a tour with our Director, Lori Flores, at 309-692-3470. For more information, complete our online form or send us an email at info@123younmepreschool.com.